You bought that nice big bag of organic potatoes and cooked some, planning to use the rest later. But, when you came back to the bag, weeks later, the potatoes were soft and growing tentacles! What to do? First off, don’t eat them. Ew. You have two choices: compost them, or grow them. Potatoes that have grown “eyes” are really just sprouting, ready to produce a new plant that will grow more potatoes. You can turn this accident into a boon for yourself and your garden, because now you have “seed” potatoes. The instructions below will work for both grocery potatoes and purchased seed potatoes. As I am a lazy gardener, let me start with the fact that you can just throw the potatoes as they are, eyes and all, directly into your growing medium and call it a day. 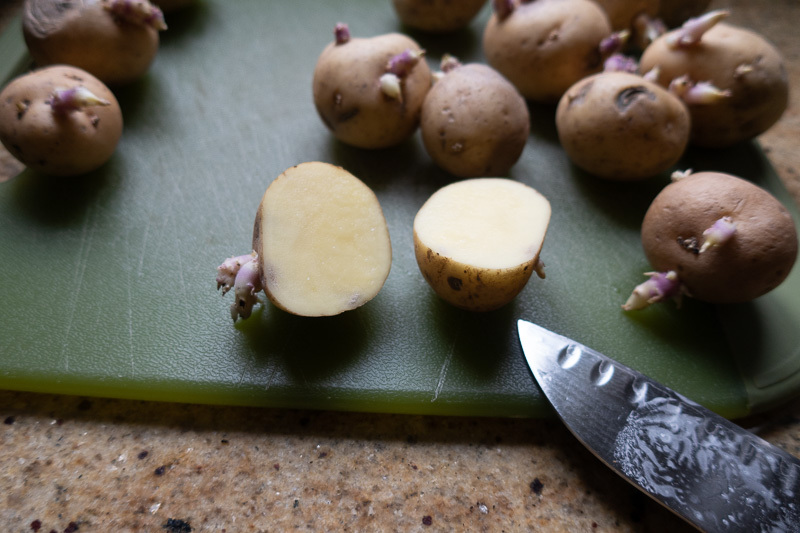 However, for best results, you should cut the potatoes into smaller pieces, with at least one or two eyes per piece. Smaller potatoes, with only one or two eyes, should be left whole. If you have large eyes sprouting on the potatoes already, be careful that you do not break them off. Cut the potatoes with a clean knife to leave 1 or 2 eyes on each resulting piece. 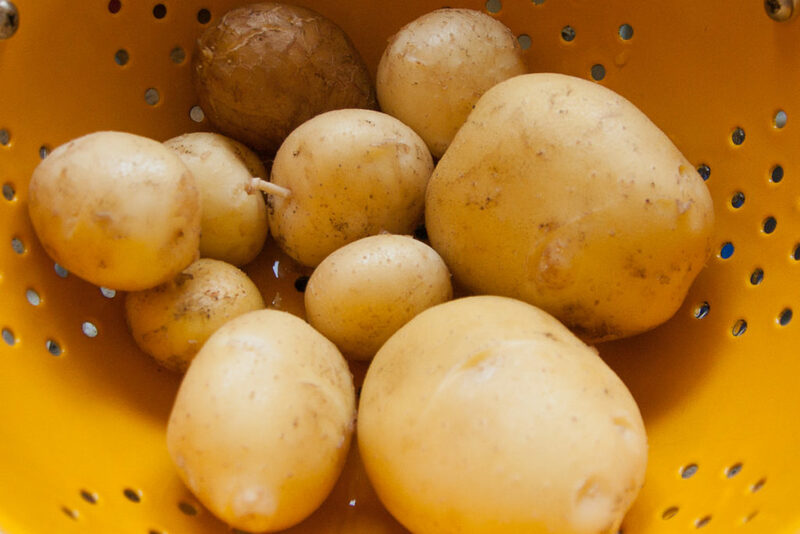 If you find mold growth on any part of the potato, toss it in the compost–these are already halfway to compost. Grow from healthy-looking seed potatoes only. A potato that is too rotten to use. Compost time! 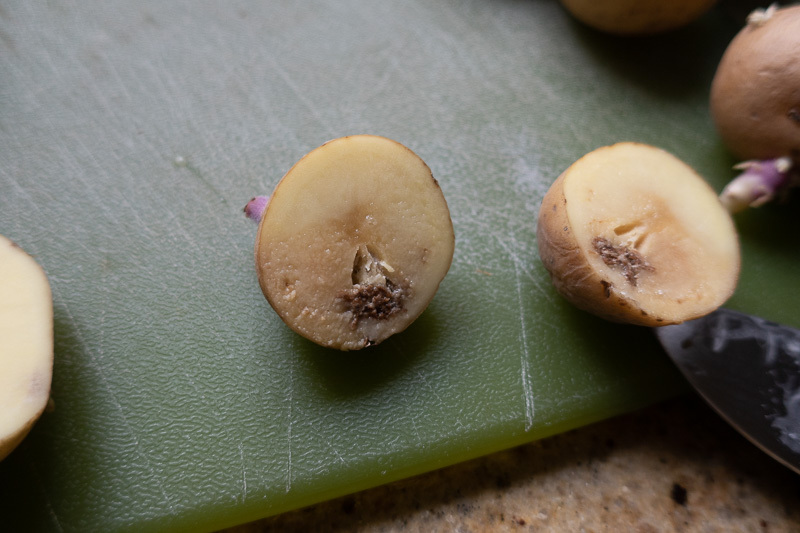 Once you have cut the potatoes, you need to let the cut parts callus over so that they do not encourage rot once in the wet soil. 1-2 days is ideal. You will see the cut part hardened up and dry when it is ready. 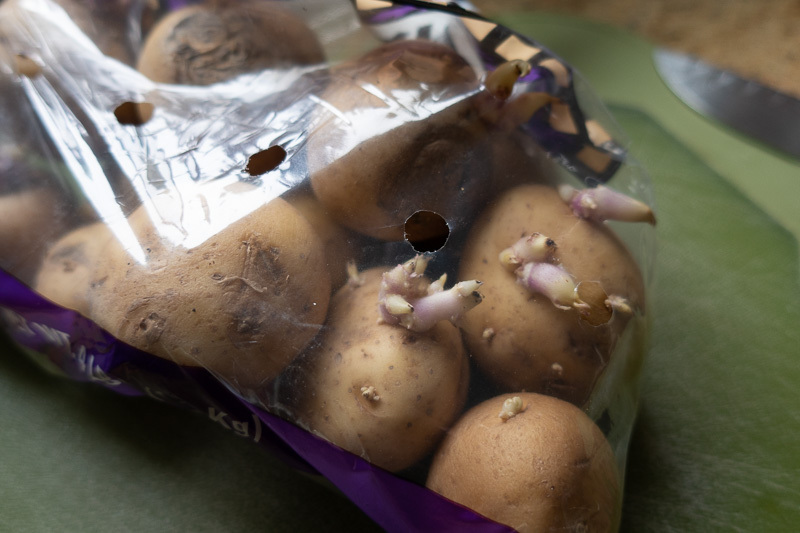 I store my potatoes in a cardboard box, and after a few days they form a nice, hard callus over the cut edges. Potatoes are not picky about their soil. 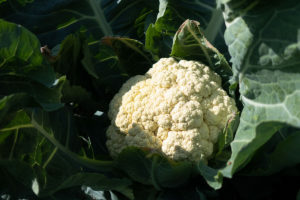 They will grow in pure compost or just dirt, or even just straw (with some fertilizer). The only things potatoes require is a loose growing medium. They have to form tubers, not just thin little roots, so if the soil is too packed, the potatoes will be stunted or very small. 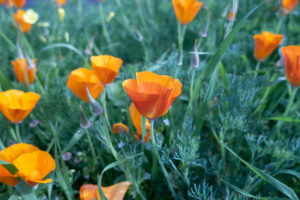 If your soil is mostly clay, amend it with something like compost, dried grass clippings, or sand. You can grow potatoes in containers, or even towers. There are lots of resources online for ways to do this (like This One), and these are usually designed to generate the most potatoes per square foot. If you are looking for mass quantities of spuds, it’s a great option. For me, I like to just grow a few plants since we don’t eat potatoes that often (ahem, eyes on the stored ones), so I stick to a small patch in the garden. Pick a full-sun spot, plant anytime from February through September, leaving the eyes facing up, and cover with about an inch of soil. If you are worried about the potatoes possibly carrying diseases that can infect your garden, which is the Number One reason against growing store potatoes in your garden, you can isolate the potatoes in a large pot, bucket, or tower. 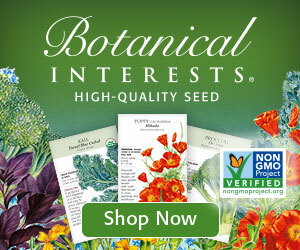 Seed potatoes from nurseries or online stores are guaranteed to be disease-free. A spud in the ground, ready to be covered with soil. 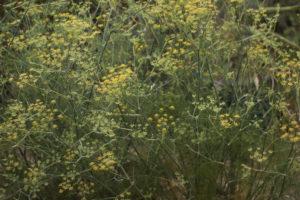 You should see sprouts in one to two weeks, and the plant will grow heartily if watered regularly. As soon as you get leaves above ground, you can start adding more soil to mound around the stem, burying the lowest leaves. This is called “hilling” and this will cause the plant to turn those leaves into roots/tubers, increasing yield. This is not required, just an option. If you do hill your potatoes, do it in stages, and only do it up to about six inches above the original ground level. 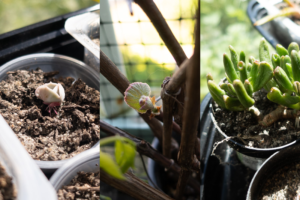 Also, be sure to stop doing it once the plant starts to flower. Potato flowers look like white tomato flowers, and are a sign that your plant is producing potatoes under the ground. When the flowers die off, your potatoes are ready to harvest. They will last for a bit of time under the ground, as well, but be aware that if you leave them too long they will themselves sprout and you’ll have volunteer potato plants everywhere (Problem or best possible outcome? You decide). Using your hands or a shovel, carefully start at least six inches away from your plant and scoop down and toward the main plant to find potatoes. You want to avoid damaging the potatoes or ripping the skin. 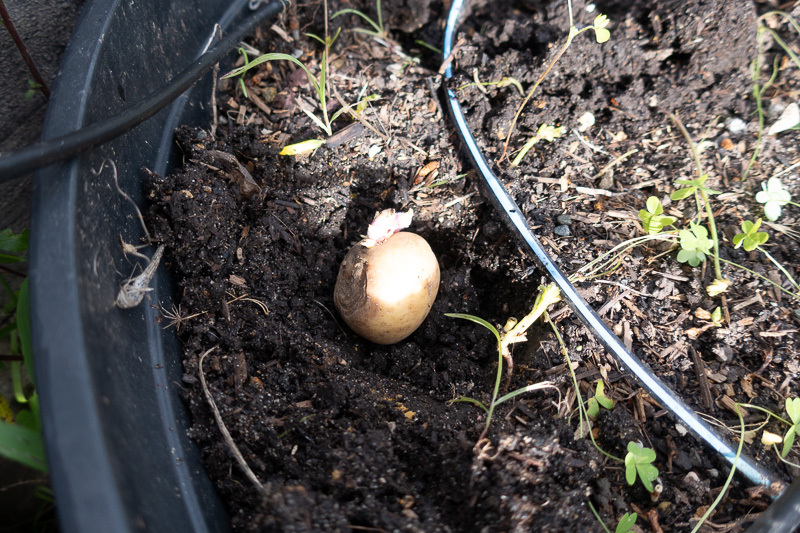 I find that dry soil is easier to work to get the potatoes out whole and intact, and some varieties will even just come with the roots if you pull the plant up by the stem. 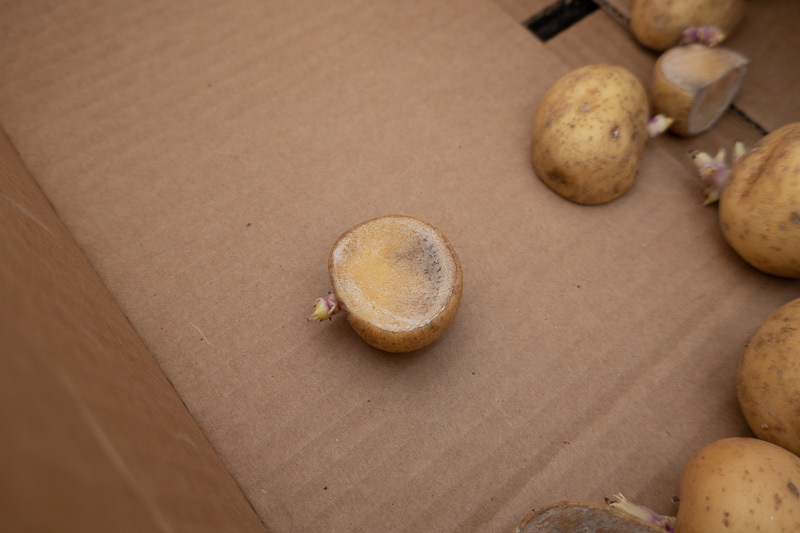 Allow the potatoes to dry in a shady spot or indoors, making sure to move potatoes out of the sunlight by the end of the day or you will get green, inedible potatoes. When the dirt on the surface is dry, you can carefully brush it off, but do not wash the potatoes until you are ready to eat. Store like you do store-bought potatoes, in a dark, cool place. Washed and ready-to-eat golden potatoes. 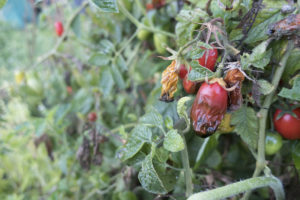 If you happen to see red fruit growing on your potato plant, remove it. It may look like a cherry tomato, but it is poisonous, and should not be consumed. If, during the growing season, you see potatoes bursting through at the surface of the soil, bury them immediately. Light will turn the potatoes green, which triggers the release of a toxin in to the potato. Likewise, if you harvest potatoes, do not eat any that appear green. The amount of fully green potatoes it would take to harm a healthy adult is so much it is next to impossible to cause serious issues, but children and compromised people may get sick from green potatoes. To be safe, do not eat them, and, if you must eat them (because you are stubborn), remove the green parts and all the skin from the green ones, as that is where most of the toxin resides.